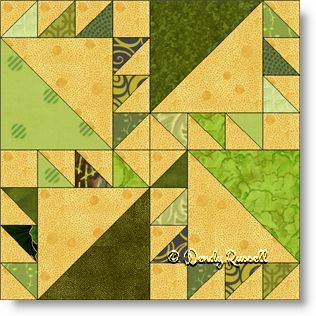 I couldn't resist using the obvious colour in my version of the Irish Puzzle quilt block, but don't let that stop your imagination from creating your own stunning version of this block. I have chosen to place this four patch block in the intermediate category of difficulty simply due to the large number of patches required to create the block. However, all patches are easy to sew and the only issue is maintaining precision to achieve accurate half square triangles. The sample quilts illustrated give you ideas of using a straight setting or an on point setting of the quilt blocks. You are only limited by your creativity.